I love Sloan’s russian school. They are so sweet and they work really hard with Sloan – and with me. I gotta say, though, that the homework they give is killing me! 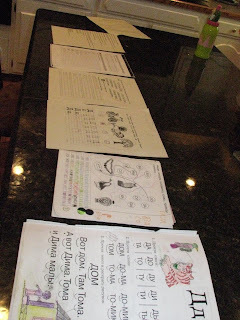 This poorly taken picture is the homework that Sloan had to complete just between Monday and Thursday! There were three writing exercises, two pages to read, two lines of a poem to memorize (to be fair, we have a couple more weeks before he has to recite them) and a play to work on. That may not seem like a lot, but when it’s in a foreign language it takes twice the amount of time to complete – although Sloan is getting very fast at his reading. The last two pages at the top of the photo are the play. Sloan only has a few lines to learn, but I need to translate the whole thing for him so the poor kid knows what’s going on when they perform it. Since he’s the only kid at the school without a russian parent he’s at a major disadvantage. All of the other kids are fluent already in the language. Sloan understnads it, but speaking is hard for him. 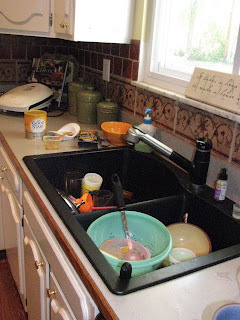 It’s my fault – I try to speak russian with them some at home, but it’s just really hard to do that and still keep order in our house. So, I will be sitting down in a minute and translating a four page play with lots of big words in it! I feel like I’m in college again. This, incidentally, is why I have yet to teach him how to read in English. Oh yeah, and I’ve got this to deal with, as well as three loads of laundry to put away. There will be no resting today. ‘Kay – gotta go! As the Halloween season approaches I thought I’d pass on the name of a great book that I think is important for parents to read – particularly those who struggle with the concept of Halloween. It seems that Halloween has gotten a little bit of a bad wrap over the years. What can be, and should be, a fun, innocent holiday for children has been mired by slasher movies and horror tales of cult-like sacrifices. This, in my opinion, is unfortunate because Halloween is really a fun time for both children and parents. The idea of Halloween being a pagan holiday is particularly prevalent among christian circles. I understand where this is coming from. 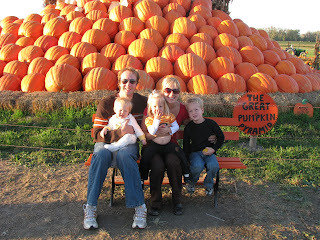 In fact, Lee and I really debated whether or not we would celebrate Halloween with our kids. Both of us just assumed that Halloween was a holiday that opened the door to evil and wondered if we should just scrap it. 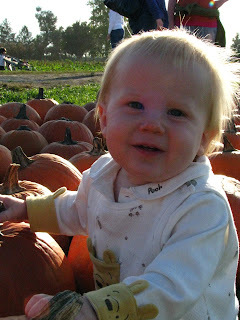 But, when Sloan was born, it broke my heart to think of not dressing him up and parading him around the neighborhood, showing off his cute, fat cheeks and racking up a little sugary delight. I also couldn’t figure out how to not celebrate the holiday without it seeming weird. Did we hand out candy to trick or treaters, but just not take our kids Trick or Treating? That didn’t seem right because it just makes the practice of Trick or Treating seem wrong. Did we turn off all the lights and hide in a dark corner all night, ignoring the Trick or Treaters on our front step? That didn’t seem like a good conclusion either because how would we explain that to our kids? And, while I love fall festivals that church’s put on and have no problem attending them, the fact is, they are still a celebration of the holiday called Halloween. So before Lee and I made a decision, I decided it was time to research Halloween. And I am glad I did! 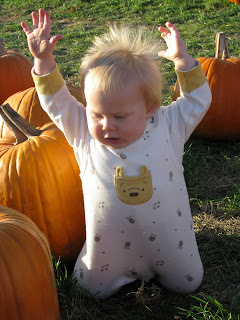 I came across a book called Redeeming Halloween: Celebrating Without Selling Out. This book was published by Focus on the Family, a reputable christian organization whose focus is, oddly enough, on issues that affect families. I learned a lot from this book. Perhaps the thing that most surprised me was the fact the Halloween, the original holiday, is not pagan but rather a Christian holiday. It stands for All Hallow ‘een or “the eve of the holy ones“. Under the reign of Nero, a tyrannous and horrible Roman leader, christian’s were brutally murdered in public places. Literally thrown before the lions, christians in early Rome were martyred for no other reason than that Nero felt threatened by them. In A.D. 610, as the church gained more honor, these martyrs were officially recognized and given their own holiday, All Saints’ Day or All Hallows Day. This holiday eventually landed on the calendar on November 1. It was meant to be a day for the church to remember and recognize the believers who died for their faith. Now, there is no denying that this meaning of Halloween has been wildly distorted over the centuries. But the fact remains that Halloween is not pagan, and this book gives great suggestions of ways to celebrate Halloween by merging the traditions that we have today, trick or treating, with the true meaning of the holiday. After all, isn’t that what we try to do at Christmas as well? If you think about it, Christmas has also been dreadfully distorted and paganized. So where did the costumes and trick or treating come into play? The authors state that there is no real conclusive evidence as to where this tradition began but there is some historical evidence that in the mid-1800’s, masquaraders would go from door to door performing plays in exchange for food or drink. Around this time, a large population of Irish immigrants came to America bringing with them a tradition known as “mischeif night” where they would canvas neighborhoods playing harmless tricks on their neighbors. By the 1920’s, however, this tradition had gotten out of hand leading to true vandalism, so a small town mayor instituted a night where “good” children could go to neighbor’s homes and shops, crying “Trick or Treat!” The idea was that the shop owners should give them a treat so they wouldn’t be “tricked.” Placing this tradition on the eve of All Hallow’s Day was merely a way to designate it as a once a year occasion. So, for those of you who may be unsure of whether or not to celebrate Halloween, I highly recommend this book. You still have to do what you feel is right for your family, but you owe it to yourself to be educated about the decision you are making. 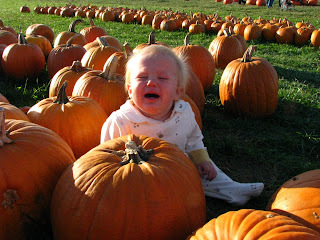 For those of you who celebrate Halloween but feel guilty about doing so – Don’t! You don’t have to skulk around on Halloween hoping no one from church see’s you taking your kids out. Bottom line is that there are ways to enjoy the innocence and the fun of Halloween without partaking of the evil that pervades. So, in closing, Happy Halloween! 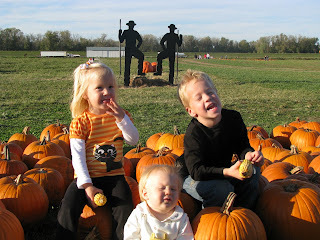 We bought our pumpkins yesterday at the grocery store. I let Sloan help me put them into the cart. As we were loading them, Sloan asked, “Mom, can we skarf these tonight?” For the record, he meant carve. Maybe it’s me. Perhaps it’s the fact that I, as a non-coffee drinker, usually visit Starbucks under the direst of circumstances in need of a quick fix so that I do not bring harm to my children through my sleep deprived stupor. Or, if I’m not visiting out of necessity, but rathe out of pure indulgence for a Soy Chai Latte (yes, Wanida, I tried it again…and againandagain and I do indeed like it with the soy. I feel so SoCal! ), then perhaps in my self absorbtion I am hyper sensitive to the giddy nature of those who are indulging my new addiction. At any rate, I like it. I love the happy little fella that cheerfully sends me on my way, my belly full of warm comfort. I find myself driving away whistling “It’s a Sunshine Day,” all Brady like and happy. Well done Starbucks. Keep up the good work! I have several things to share, but no time to share them as this week is CRAZY! So much to do, so little time. And mama is so very tired. I think I’m fighting off some sort of bug because I’m just exhausted all the time. But because I don’t have time to be sick, I press on so…onward! We had a fun weekend. Sloan had his final soccer game and got his trophy, which he just thought was super cool! We discovered this weekend that Landon loves to play with balls and will spend significant amounts of time pushing a ball around the house – that is if said ball isn’t snatched by his sister. He will also roll the ball back and forth with us, which is so cute. 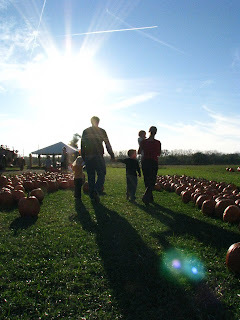 We headed to the pumpkin patch on Sunday – a gorgeous day. We went with our good friends, the James, which made it even more fun. That’s a good activity to share with another family. 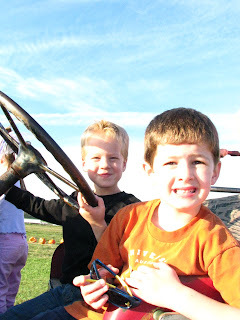 The kids had fun running through the rows of pumpkins, playing on all the tractors and trucks, and taking pony rides. Good times. And finally, an exciting bit of personal news – I was appointed the editor of the St. Louis Blogger’s Guild at last night’s meeting. I’m really excited about this, and a little nervous. I will be writing one post per week for the guild site and organizing/editing two additional posts each week, which will be written by different members of the guild. This will give me a chance to learn more about social media, contribute to the guild, and have a specific writing deadline which just makes the blood of a writer course electrically through her veins. So, all in all, we’re doing well. Enjoy the pictures. 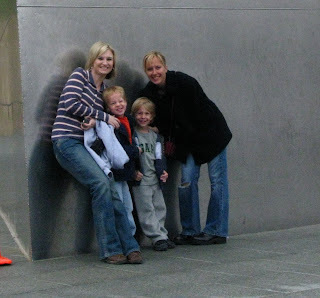 The most decent family shot we got. Thanks Suzanne! Sloan and his friend Bobby playing on the big fire truck. Landon was having a blast. Poor baby. 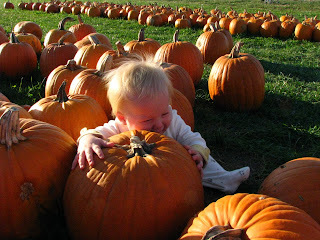 All the adults were laughing at him so he got a little love from the pumpkin. Sloan: “Yeah, but I just like him better. Seriously, you know it’s bad when a five-year-old is tired of the whining! 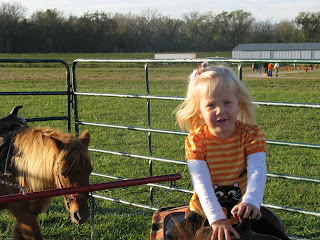 Sloan, my wonderful, beautiful, spectacular five-year-old, is also a bit of a toot these days. Man, he’s giving us a run for our money. The only thing I take comfort in is the fact that he must know that there is nothing on this earth that he could ever do to make us stop loving him, because he’s so difficult right now that some days all I have to lean on are my deepest feelings of motherly love (but I don’t always like him). We feel like we are in a spiritual battle with him right now. He’s so close to salvation. He’s asking a lot of questions, but isn’t ready to accept Christ just yet. I asked him the other day after a particularly poignant conversation, if he wanted to pray and ask Jesus into his heart. Without missing a beat he replied, “No, not today.” The boy knows what he wants. So anyway, satan is digging at his little spirit, but Lee and I will not give up this fight. There are some days when I would like to throw the towel in and say, “Fine. You win. I’m done.” But that’s not an option. My son’s eternal soul is so desperately important to me and so I will stay on my knees and I will continue to beg the Lord to give me the strength, grace, peace and patience to parent him. And I am trusting that the Lord will show me some fruit from these early years of toil. Parenting is hard! My good bud, Lindsey tagged me and because I love her SO much, I am participating! * Link your tagger and list these rules on your blog. * Share 7 facts about yourself on your blog. * Let them know they are tagged by leaving a comment on their blog…. 1. I love cold food. I know it’s weird, but I love taking food out of the fridge and just eating it cold. My favorites are spagetti and pizza, but I’ll eat just about anything cold and usually like it better than when it was warm. 2. I have an abnormal fear of airplane bathrooms, which I’ve discussed before here. But, seriously, I am terrified to use an airplane bathroom on the off chance that somehow the little stall will dislodge itself from the rest of the plane and I will plummet to the earth with my pants around my ankles. *sigh* I’m a dork. 3. My very favorite book in the world is Anna Karenina. I’ve read it at least three times and every time I put it down and sigh at the greatness of it! My next favorite book is Jane Eyre, another that just makes me smile and swoon. Finally, my third favorite book of all time is The Last of the Really Great Wangdoodles. It’s written by Julie (Andrews) Edwards (aka Mary Poppins). It’s a kids book, but it’s so awesome. I’ve read it at least 25 times. My third grade teacher read it to us, and I’ve read it once or twice a year since then! I even read it to Lee right after we got married (isn’t that such a newly married thing to do?). I’m excited for the kids to get a little older so I can read it to them. 4. I have a weird and uncanny ability to impersonate people. I can do a mean Ace Ventura impersonation, which has gotten me nowhere in life, but did help me win over the boys in high school. I can sing in such a way that I can sound a lot like whoever’s song I am singing (within reason – my range is not in the league of some people out there). My favorite person to impersonate in song is Barbra Streisand. 5. I started out in college majoring in musical theater but quickly dropped that when I realized I had to sell my soul to the theater department and I decided I wanted a life. 6. My grandparents were pioneer missionaries to the islands in the West Indies and the Bahamas. My mom grew up in the islands and my uncle now runs a mission organization that takes groups into several different countries and islands. It is for this reason that I think I have a little more salt in my blood than the average person, and I therefore love the islands and the Caribbean so very much. I also deeply, deeply admire my grandparents, both of whom are already sitting before the throne of God. 7. I absolutely love throwing tea parties and have a secret desire to one day own my own tea shop. I love the scones and the pettifores, the finger sandwiches and the different blends of tea. I do not love cooking, or really even baking, unless it’s baking for a group of women who are going to have high tea with me. I am planning on taking Tia to her first high tea this winter and can’t wait. …And don’t worry, ladies – I won’t be offended if you decide you don’t want to participate! Anyway, San Diego is gorgeous. A really neat, pretty place. And I stayed with, and visited such dear, dear friends. 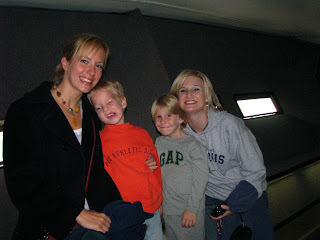 When Lee and I lived in Dallas, we met Matt and Wendy Brunner and instantly had a connection with them. Despite living in separate cities now for several years, we have remained closely bonded. God just knit our hearts together in a special way so many years ago. Wendy is one of the godliest women I’ve ever met and I was refreshed this weekend as we spent many hours talking. Wendy is leading a women’s retreat this coming weekend and read me her material. I was so encouraged by her and I’m so grateful for the time I had. I also visited my friend Wanida, whom I’ve not seen in almost 10 years!! We lost contact after college, but Wanida is another dear friend who God just knit my heart to in a special way. Wanida and I spent the day sight-seeing. 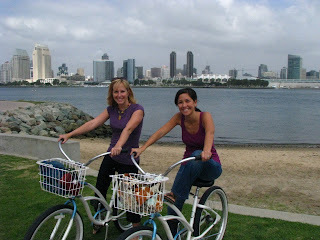 We rode bikes on Coronado Island. We went to La Jolla and sat on the beach. 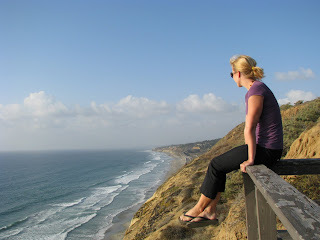 We went to Torrey Pines where I saw the famous golf course, then hiked in Torrey Pines park, which was gor-geous! Then we went to Del Mar and stood at the beach watching the surfers! So cool. What a fun place to live. 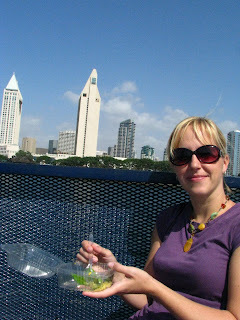 We took the ferry round trip to visit Coronado. Isn’t it beautiful? It was so fun to be able to look back and see downtown San Diego. Wanida told me that sitting on the edge of this lookout would make me feel like I was sitting on the edge of the world. She was right. It also made me feel like I was going to plummet to my death though, so I didn’t hang out there long. 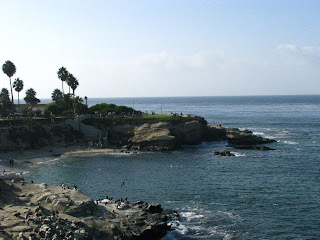 La Jolla beach. I went back there by myself on Sunday morning. I took my Bible, sat at a quaint little cafe overlooking the water, and just drank in the morning. I haven’t done something like that in years. It was awesome! Update: Mystery solved (check the comments). The person who I suspected is indeed the culprit, though I’m still a little baffled by the Sephora box. Anyway, Brad Dearborn is a dear friend and mentor to me (a spiritual mentor as well as a mentor in the art of practical jokes). Brad led a bible study that I was in in high school and had such an impact on my life back then. As you can see, his sense of humor is wonderfully dry and wickedly funny – yes, there were many a dropped off item at my parents house over the years from toilets to a headless goose. And those things always made their way back to Brad’s house, either by me or by my mom, who, I must say, also has a wickedly mischevious sense of humor. Thank you, Brad. You’ve provided many years of laughter and it’s moving on to another generation. Brilliant. I love you dearly! I’m off to San Diego tomorrow morning early to visit with dear, dear friends. I’m so excited and I’m going crazy right now trying to get ready. I’ll be back next Monday. 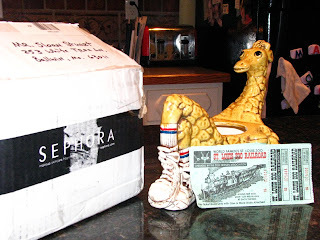 Sloan received a mystery package in the mail today from someone who obviously reads this blog. 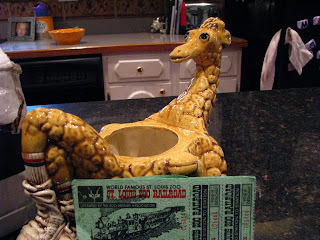 It is a ceramic giraffe with it’s legs crossed and a couple of tickets to the St. Louis Zoo. Who is it from? It was sent from Ballwin. At first I thought I knew for sure who had sent it, but the Sephora box has thrown me for a loop. Anyway, whoever you are – well done! I have laughed all afternoon. If you didn’t read the giraffe post, click here.